Evo & Grace: The WanderLusts: The 19th National Press Forum and 2015 Philippine Press Institute Annual Membership meeting. The 19th National Press Forum and 2015 Philippine Press Institute Annual Membership meeting. 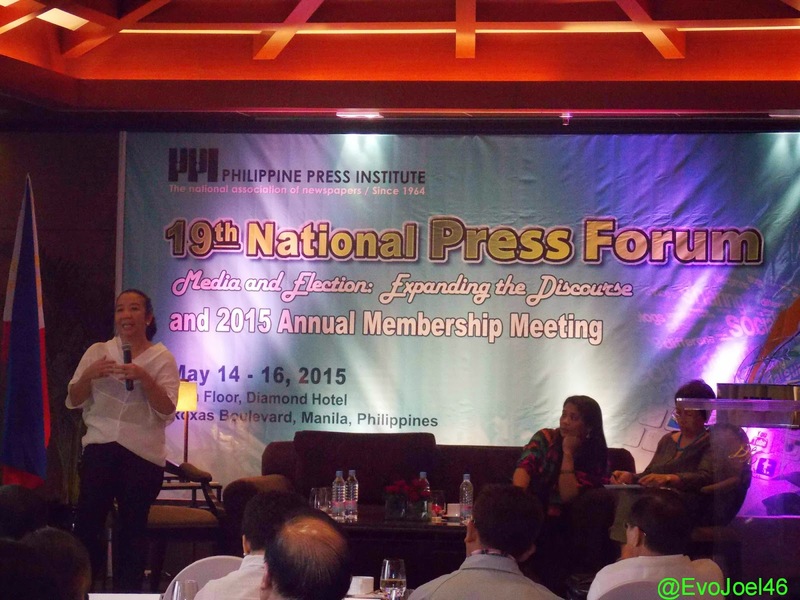 Media and election coverage highlight this year’s Press Forum. 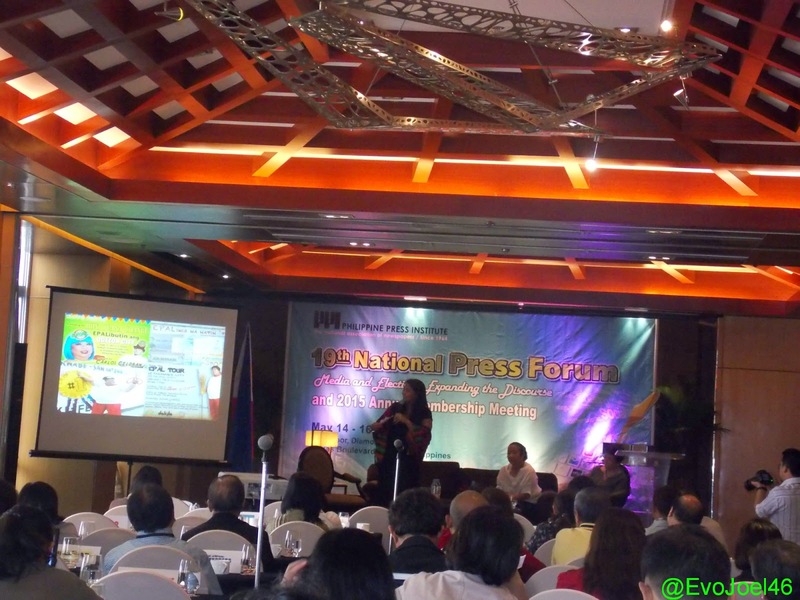 The incoming national and local election in the Philippines, is the main topic for this year’s National Press forum, held at Diamond Hotel last May 14 to 16, 2015. Among its resource speakers are Betty Romero, the Deputy Director of Lifeline Foundation, and the administrator of the successful Anti-Epal Facebook page. Romero discusses how powerful social media now a days, wherein his personal advocacy become the voice of the nation about politicians claiming credits to the projects that they are mandated to do. Majority of the photos post in their page are now remove after many views, comments and shares in the web happen, and those photos are being contributed only by their followers from all over the country. Another speaker is Rowena Paraan, the head person of Bayan Mo, iPatrol Mo of TV network ABS-CBN. On her talks she discuss that tru tweets and status post, news was first heard and seen, their aim is to make everyone a journalist using mobile gadgets by tweeting or posting status, or even pictures that can tell a news event that is about to happen or just happen. Philippine Press Institute is considered the oldest professional media association whose mandate is to defend press freedom and promote ethical standards of Filipino Journalist. It was founded in 1964 and reactivated in 1987. It is also known as the national association of newspapers. 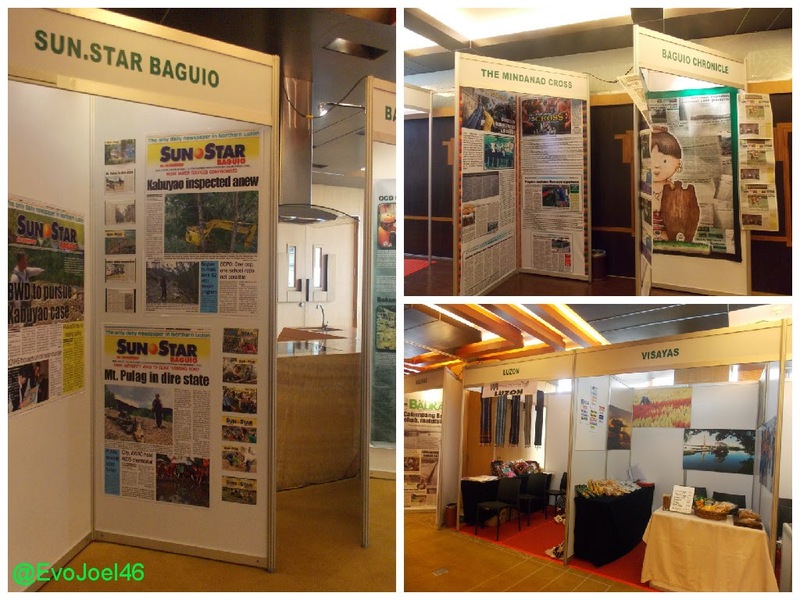 Among its rosters of past chairmans who are publishers and editors, are Joaquin Chino Roces of The Manila Times, Eugenio Lopez, Jr of The Manila Chronicle, and others. This year’s chairman is Atty. Jesus Dureza of Mindanao Times. In this year’s program, new partners such as Oceana Philppines, Plan International, Asian Legal Resource Center and #MediaSeum are introduce, to be working hand-in-hand with PPI throughout the year. PPI can be reach thru their office at Room 206 BF Condominium, Intramuros Manila. Or contact them at Tel Nos. 527-9632/527-4478, or check www.philpressinstitute.com and email at pp1@mozcom.com .